Long Beach’s city budget passed September 5, and there were a few biscuits added to it for shelter animals. 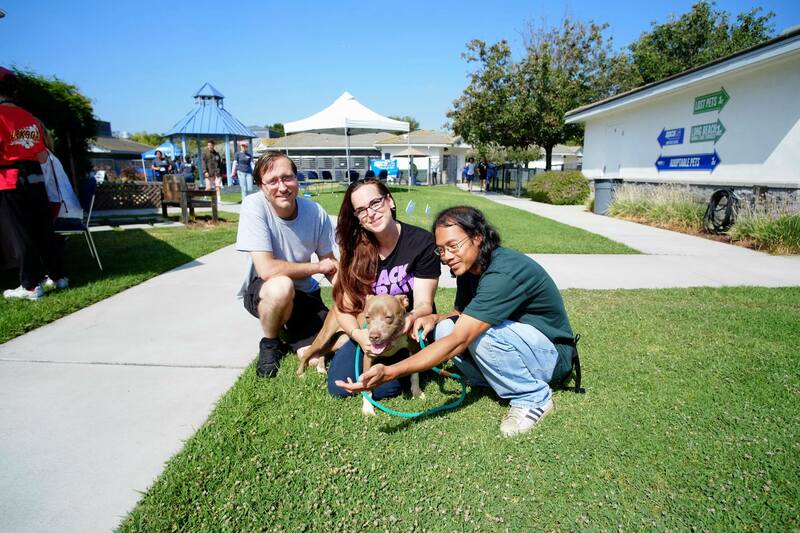 The City of Long Beach Animal Care Services received funding for a full-time registered veterinary technician to help with the admissions procedures and shelter population health, and converting the existing part-time outreach position to full time. Duties include marketing and advertising of all ACS programs, highlighting them through traditional and social media outlets, and keeping accurate records; scheduling and attending special events in the community and the shelter; updating the photos on the shelter’s Facebook page and other social media; respond to public inquiries; and most importantly, building relationships with rescue groups and partners to increase live outcomes for the shelter’s pets. The position also includes working closely with the behavior and rehoming team to secure positive outcomes for the shelter’s residents. ACS übervolunteer Ricky Kim shares a fond farewell with one of his best friends, who’s going to a new home with the couple in the photo. Photo courtesy of ACS. Over and above the approved positions, the council approved a one-time allotment of $50,000 for shelter improvements. The item passed after a motion by Fifth District Council Member Stacy Mungo, who said that the funds will be used in accordance with the results of a shelter audit from City Auditor Laura Doud. According to Meghan King, Communications Manager for the City Auditor’s office, the shelter audit was undertaken to evaluate ACS’s operations and determine the extent to which policies, procedures and practices are effective. She anticipates the release of Phase One by the end of the year and Phase Two to be published later this year. Mungo expressed the council’s support for better programs for the City and said that there are continual appeals from the community for rescuing and supporting shelter animals. She stressed the importance of the council hearing the shelter needs from the community’s perspective. And hear those needs they did, in the form of vocal advocacy from a newly formed shelter-pet-advocacy group. With its members garbed in white shirts and blouses and holding up signs declaring support for shelter animals, the Long Beach Animal Advocates (LBAA) attended every City Council meeting that pertained to the budget. It can also be reasonably assumed that LBAA’s continued presence at the meetings was a reason for the grant. The group’s members were adamant about working with the shelter to get the animals’ needs met and to hopefully reach a goal of 90 percent no-kill through additional shelter funding, grant writing, strengthening adoptions and volunteer program, and implementing a foster program for ACS animals. The existing foster program comprises only pets from spcaLA, which shares the P. D. Pitchford Companion Animal Village with ACS. 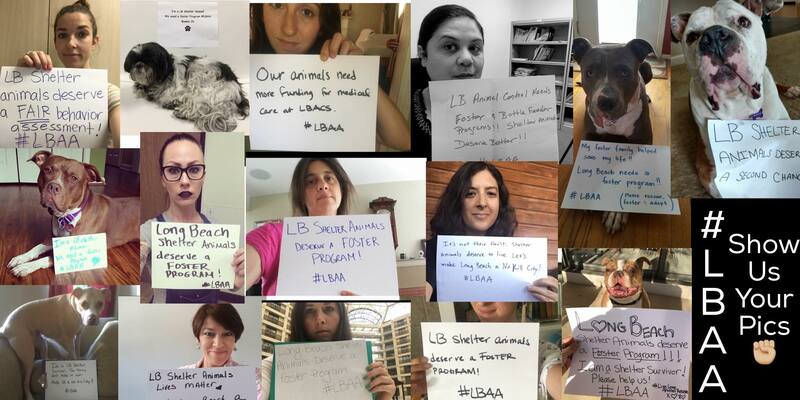 LBAA’s member collage, with their steadfast vows of advocacy. Graphic courtesy of LBAA. LBAA’s founder, Emily Ghosh, said that she’s grateful for the additional funding, but it’s only a beginning. The shelter has been focusing on constructing the new doggie-play-group yard, which had been funded prior to the additional $50,000 grant. ACS Manager Ted Stevens said that training for staff and play groups are part of the implementation of the yard. Ghosh said that besides this project, she’d like very much to see an increase in hours for staff, the aforementioned foster program serving shelter pets, and community projects such as snazzing up the screened-in “catio” for adoptable cats to frolic and laze in. In all, she suggested an overhaul and shifting of the shelter’s culture to achieve a positive outcome for the animals. Find out more about LBAA here. To add your service to shelter pets as a volunteer, visit this page. There are a number of ways for everyone to get involved. ACS also needs in-kind donations for the shelter-enrichment program, which provides special treats and ambience enhancement. Email [email protected] for information. ~ Meme present on T-shirts, bumper stickers, Pinterest and those clever little retro postcard thingies, and which a lot of us live and wonder.